The city of Atlanta expanded its fleet of snow response equipment from 10 pieces to 58 Tuesday amid mounting criticism over what many considered the city's failure to adequately prepare and respond to the biggest snow event in at least a decade. So far, city crews have focused on clearing high priority routes, such as bridges and roads leading to hospitals, and providing emergency and essential services to residents, Mayor Kasim Reed said Tuesday. 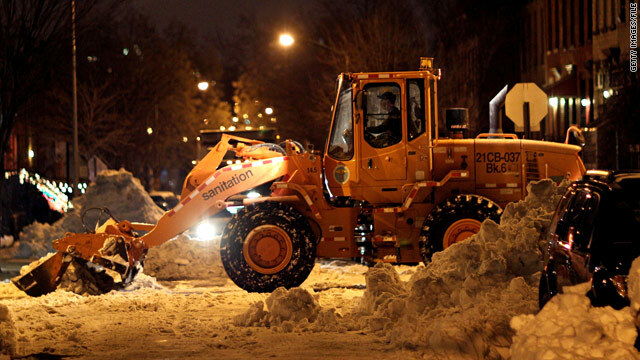 Of those 200 miles of high priority roadways, 150 have been cleared, and crews worked on clearing neighborhood and side streets Tuesday night after obtaining more equipment from private contractors. Many of those streets are maintained by the Georgia Department of Transportation, which is partnering with the city to clean the streets tonight. Reed said the city had attempted to prepare for the snowstorm, which left most major roads, interstates and sides streets covered in ice, paralyzing the city with widespread closures of schools and businesses. Residents are still being encouraged not to drive tomorrow to allow cleanup crews to effectively clear the roads. He acknowledged, however, that preparations before the storm that grew the fleet from 10 to 22 pieces of equipment was not enough, as officials had hoped it would be based on previous snow events. Arizona Gov. Jan Brewer signed emergency legislation into law. Arizona enacts funeral protest legislation: Arizona Gov. Jan Brewer signed emergency legislation Tuesday that bars protests within 300 feet of a funeral and within an hour from its beginning or end. Earlier in the day, the state legislature passed the measure, which targets a Kansas church whose members announced they planned to picket the funerals of the victims of Saturday's shootings in Tucson. Suspect's parents: 'We care very deeply' about victims' families: The parents of Jared Lee Loughner, suspected in the Tucson, Arizona, shootings that left six people dead and U.S. Rep. Gabrielle Giffords critically wounded, said Tuesday they do not know why the incident occurred and that they are "very sorry" for the loss felt by victims' families. The cost of leaving AT&T for a Verizon iPhone: What would it cost for iPhone users to buy out of their AT&T contract to get Verizon Wireless' iPhone? That depends on when you signed up. But no matter how you cut it, it's not cheap. Brisbane braces for more flooding as 90 people reported missing: Brisbane, Australia, awoke Wednesday to sunny, clear skies amid renewed warnings that a wave of water was sweeping through the city's main river system, threatening to exceed the damage done by the record 1974 floods. Arizona's back-to-basics sheriff: A sheriff whose comments following Saturday's shooting at a Arizona political event brought him criticism has a history of taking a stand when he believes in something strongly - without much care for consequences. [Updated at 5:58 p.m. ET Wednesday] President Barack Obama will speak at Wednesday evening's memorial service for the victims of Saturday's shootings that killed six and wounded 14 at a political event in Arizona. The memorial will be at the University of Arizona in Tucson, four days after the shooting outside a Tucson supermarket at an event held by U.S. Rep. Gabrielle Giffords. The congresswoman was shot in the head and was in critical condition at a hospital Wednesday. 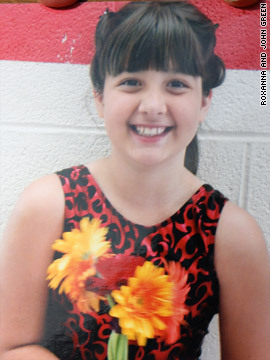 In the days since the shooting, relatives and friends of the slain have spoken about who they were. A neighbor brought Christina to the event to meet Giffords because the girl had recently been elected to the student council at Mesa Verde Elementary School. The neighbor, Susan Heilman, was shot three times and is recovering, but is struggling emotionally with the girl's death, said her husband, Bill Heilman. Born on September 11, 2001, Christina entered the world "on a tragic day and she went out on a tragic day," said her father, John Green. "There's going to be a lot of those kind of moments that - I had one this morning, just waking up. She comes up and says, 'Daddy, it's time to get up.' She didn’t do that this morning," Green told CNN on Sunday. Jared Lee Loughner is accused in a deadly shooting at a constituents meeting in Tucson, Arizona, held by U.S. Rep. Gabrielle Giffords. Jared Lee Loughner, the man accused of shooting 20 people Saturday at an Arizona political event, attended a poetry class last year at Pima County Community College, a man in the class said. Student ﻿﻿Don ﻿﻿﻿Coorough provided CNN's Special Investigations Unit with copies of two poems purportedly written by Loughner for the spring semester class. They have been transcribed below with the same spelling and line breaks as the original copies. 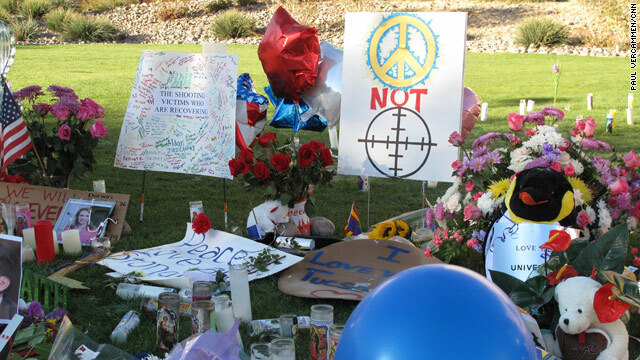 A shrine to the victims of a shooting rampage Saturday in Tucson, Arizona, grows larger Tuesday. [Updated at 9:15 p.m. ET] Arizona Gov. 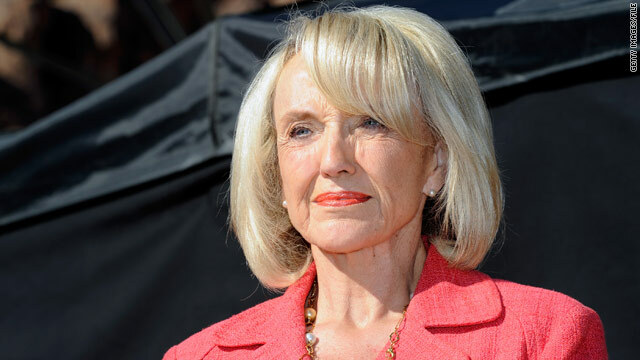 Jan Brewer signed emergency legislation Tuesday night setting limitations on protests at funerals. The bill is aimed at the Westboro Baptist Church, which plans to picket the funerals of those who died in Saturday's shootings. [Posted at 5:50 p.m. ET] The Arizona Legislature unanimously has passed a bill meant to stop church from protesting at funerals of Tucson shooting victims. The vote was 29-0 in the state Senate and 58-0 in the state House. A spokesman for Gov. Jan Brewer earlier told CNN that she was prepared to sign the bill. 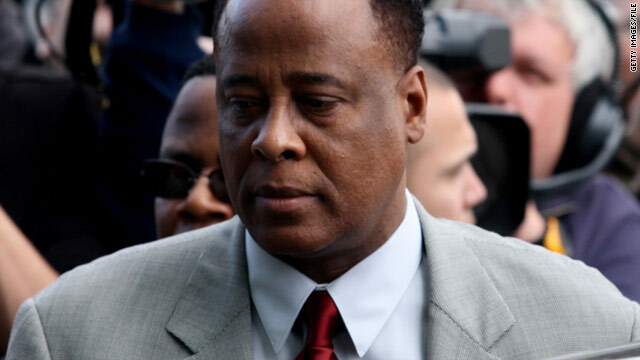 Conrad Murray, Michael Jackson's doctor, is accused of causing his death from an overdose of prescription drugs. 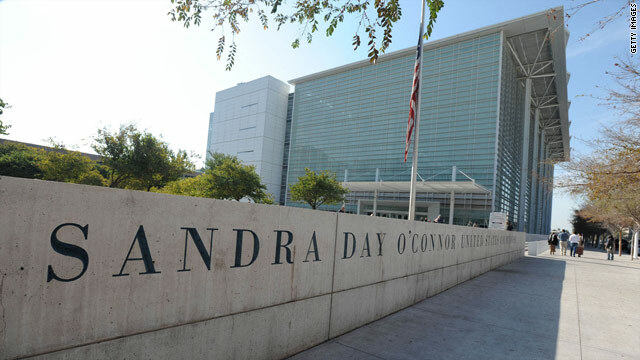 The involuntary manslaughter charge against Dr. Conrad Murray in the death of Michael Jackson will be sent to trial, a Los Angeles judge ruled Tuesday. Superior Court Judge Michael Pastor also prohibited Murray from using his California medical license until the trial is completed. The state medical board requested that be made a provision of his bail. While Michael Jackson was Murray's only and last California patient, Murray's lawyer argued a suspension in one state would prompt Texas and Nevada, where he sees patients, to also take action. Pastor denied the prosecution's request to increase Murray's bail, which is now set at $75,000. 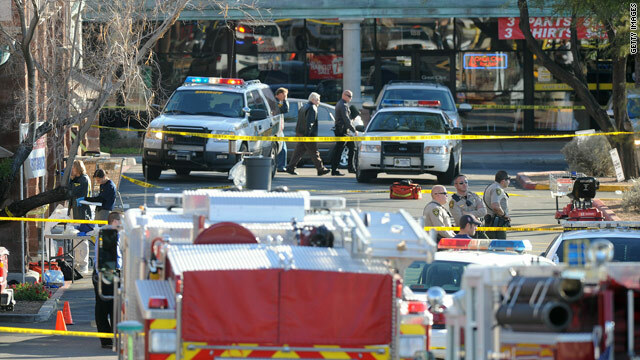 The family of Jared Lee Loughner issued a statement Tuesday regarding Saturday's shooting rampage in Tucson, Arizona. "There are no words that can possibly express how we feel. We wish that there were so we could make you feel better. We don't understand why this happened," the family said in statement handed to members of the media keeping watch outside the family's Tucson home. "It may not make any difference but we wish that we could change the heinous events of Saturday. We care very deeply about the victims and their families we are so very sorry for their loss." Loughner, 22, is accused of opening fire Saturday morning at an constituents meeting held by U.S. Rep. Gabrielle Giffords outside a Tucson Safeway. Snow blanketed much of New York in December, paralyzing traffic and blocking streets and sidewalks. New York City has issued a weather emergency declaration ahead of a winter storm expected to dump between 8 and 14 inches of snow in the region, according to a statement from emergency management spokesman Chris Gilbride. The move restricts parking and allows authorities to remove vehicles that block roadways or impede snow plows, the statement said. Verizon customers will be able to pre-order an iPhone starting February 3. 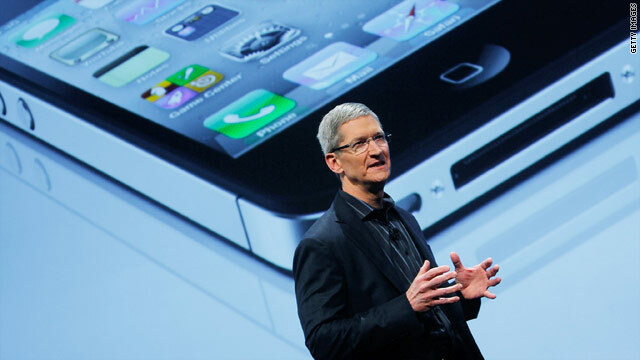 Verizon iPhone will go on sale Feb. 10: If you’re a Verizon lover who has been craving an iPhone, the wait is over. Starting February 3, Verizon customers will be able to pre-order their phones. For everyone else, the Verizon iPhone will launch Feb. 10. The cost: $199 for a 16 GB device and $299 for the 32 GB version, the same prices AT&T offers. One cool feature: A built-in ability to use it as a wireless hotspot and connect up to five additional devices. The downside: No 4G…yet. Your smartphone could be your most valuable possession: A few years ago, if your phone was stolen, the worst that would happen was the thief could make prank calls or read your text messages. Today, that same person can destroy your social life and steal your bank account. Maserati SUV with Ferrari engine: Built on the platform of Jeep Grand Cherokee at the Chrysler Group plant in Detroit, the new SUV is expected to make its debut in 2012. As the Detroit Auto Show comes to a close, check out the 15 hottest cars of the future. Attack of the inflation hawks: The Fed started a $600 billion bond-buying program in November and not everyone is on board with it. Dallas Fed President Richard Fisher wasn’t a voting member at the time, but he and two other outspoken critics have rotated into voting position. Do or die for Illinois tax hike: The state is facing a $13 billion shortfall that must be resolved by June 30. Plus, Illinois has $6 billion in unpaid bills to social service agencies, health care providers, contractors and others. State lawmakers are scrambling to pass massive personal and corporate income tax hikes before the Democratic majority lose some seats to Republicans on Wednesday. Brady Hoke is returning to a program he helped as an assistant from 1995 to 2002. After the University of Michigan fired head football coach Rich Rodriguez this month, some fans clamored for a "Michigan man," someone - unlike Rodriguez - who was previously connected to the storied program. If that was their main condition, they have gotten their wish. Michigan said Tuesday it has hired Brady Hoke as its 19th head football coach. 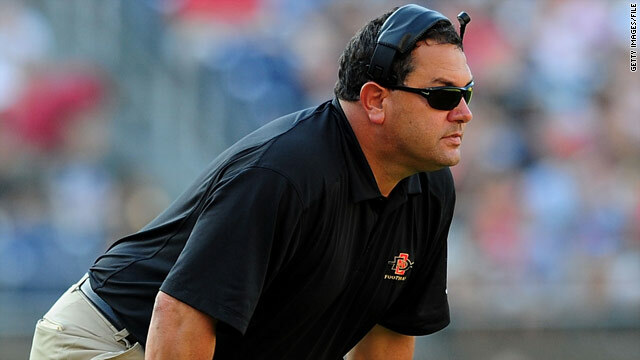 Hoke, who most recently spent two seasons coaching San Diego State, was a defensive line assistant coach at Michigan from 1995 to 2002. That span includes Michigan's 1997 national championship season. "We are pleased to announce the hiring of Brady," Michigan Athletic Director Dave Brandon said in a statement. "He is a terrific coach and will be a great ambassador and leader for our football program. We look forward to having him build a championship program on the field and in the classroom." After big snow and ice events in the Southeast, Plains, and Midwest this week, 49 out of the 50 states currently have snow on the ground - yes, even Hawaii, where snow falls in Mauna Loa and Mauna Kea all winter. The only state that has avoided this icy blast is Florida. Does that make you want to go on a nice, warm vacation to the Sunshine State? You're not alone. Put another way, that means snow is present in 69.4 percent of the lower 48, which is more than double than December. This is extremely unusual, though it's hard to put a date on when this last happened because records aren't kept on this kind of event. 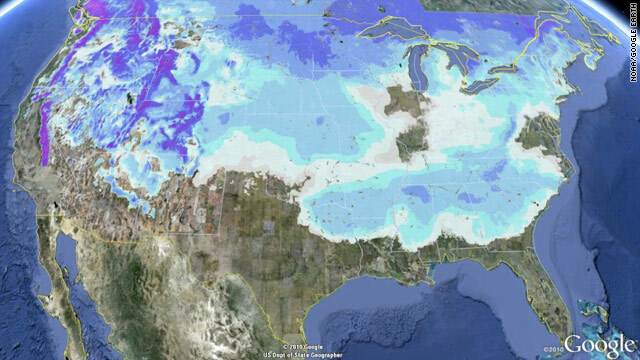 The National Operational Hydrologic Remote Sensing Center combines ground reports and images from satellites in space to determine how much of the country is covered in snow. That's what you see in the image above. The images tell how deep and widespread the snow is, and that's important not only for images like this one, but also for computer weather models, which use the data to generate accurate forecasts. Such forecasts were very useful in predicting this week's winter storms. Earlier this week, two storms began to churn: one in the northern Plains and Midwest, and one in Texas. The southern winter storm took a track across the Gulf Coast, pulling warm, moist air over an extreme arctic blast that set up over the eastern half of the United States late last week. This provided fuel for the storm to carve a path of snow, sleet, and freezing rain from Texas to the Carolinas. Here in Atlanta, we're still coated in snow and ice and probably will be for the next couple of days. No one in the Southeast escaped the wrath except, of course, Florida. But it's not over. Now that the southern-track storm has moved into the Atlantic and is moving north, the other Midwest storm is going to merge with it, creating a Nor'easter event that could dump up to two feet of snow in the Northeast. Winter storm warnings and advisories have been posted for the event - 32 states have winter storm advisories issued, by the way. 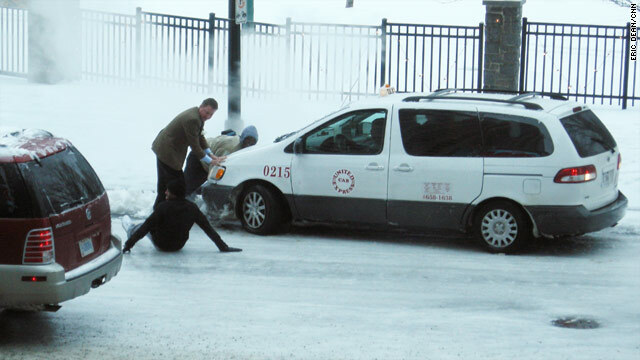 The snow and cold started early this winter and has been extreme for most of the country. Usually the Southeast avoids the blast, but not in 2011. We're all feeling a little "snowed in" this winter. Passengers wait for buses at Atlanta's Greyhound terminal Tuesday morning. 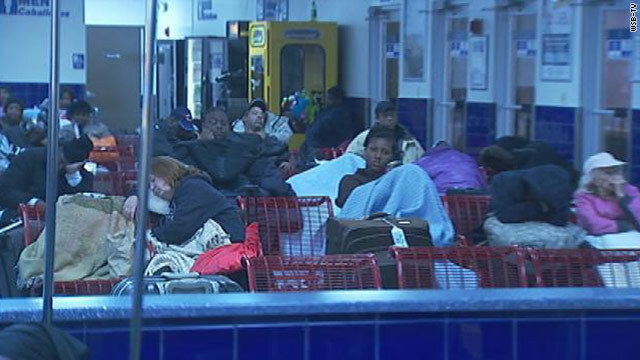 The icy roads that have paralyzed much of the Southeast since Sunday left more than 100 passengers stranded without food for more than 24 hours at a Greyhound terminal in Atlanta, Georgia, CNN affiliate WSB-TV reported. The food crisis was alleviated when passengers took the initiative to call the Atlanta mayor's office and McDonald's corporate headquarters in Illinois, WSB-TV reported. A McDonald's restaurant delivered food to the station early Tuesday morning, and the city jail provided sandwiches, bottled water and blankets that were delivered by police. "The riders were orderly and grateful for receiving the food," police spokeswoman Kim Jones told the TV station. The number of jaguars in the wild is unknown. The U.S. Fish and Wildlife Service has put off for a year proposing a critical habitat area in the Southwest for endangered jaguars. The proposal was supposed to be made this month, but the agency lacks sufficient data on the animal's habits and needs, it said Monday in a news release. Designation of critical habitat merely identifies areas where endangered species can survive. It does not affect land ownership or establish a refuge or preserve. Jaguars in Arizona and New Mexico, part of a population that is based in northern Mexico, rarely are found more than 40 miles north of the border, the wildlife service says. No females or breeding have been seen in the U.S. in more than 40 years, it says. 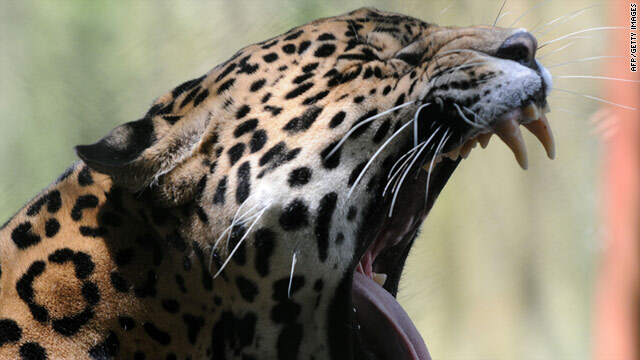 The greatest threat to jaguars in the United States is killing of individual animals, not habitat loss, the wildlife service said in January 2010. According to the conservation group Defenders of Wildlife, jaguars stand about 2.5 feet tall, are 5.5 to 8 feet long from nose to tip of the tail, and weigh 100 to 250 pounds. The number surviving in the wild is unknown. Filed under: Animals • Arizona • Environment • New Mexico • U.S.
A federal court in Arizona has issued an order recusing all district and magistrate judges from hearing Jared Lee Loughner's criminal case "to avoid the appearance of impropriety." 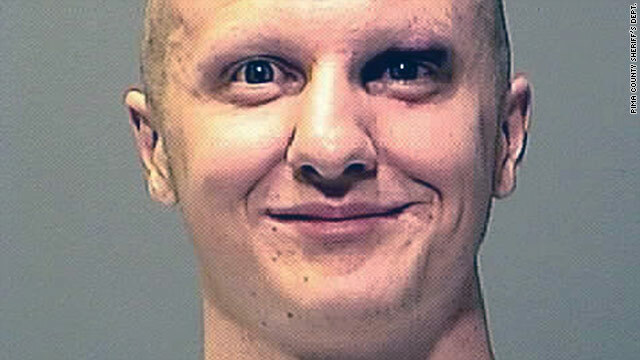 Loughner is accused of shooting 20 people Saturday outside a grocery store in Tucson. Among the six killed was federal District Judge John Roll. U.S. Rep. Gabrielle Giffords was severely wounded. Ben Shelly will take the oath of office Tuesday in Window Rock, Arizona, to become president of the Navajo Nation. Shelly and Vice President-elect Rex Lee Jim have been shadowed by criminal charges stemming from an investigation into alleged misuse of discretionary funds. The two announced Monday that they had reached an agreement with prosecutors to repay about $11,000 in exchange for dropping the charges, the Daily Times of Farmington, New Mexico, reported. A judge has to sign off on the agreement. The nation's new 24-member council also will be sworn in Tuesday. The council formerly consisted of 88 members. Organizers are expecting as many as 5,000 people to attend the swearing-in festivities, all of which will be held outdoors on a day the high is expected to be 35 degrees, the Daily Times reported. 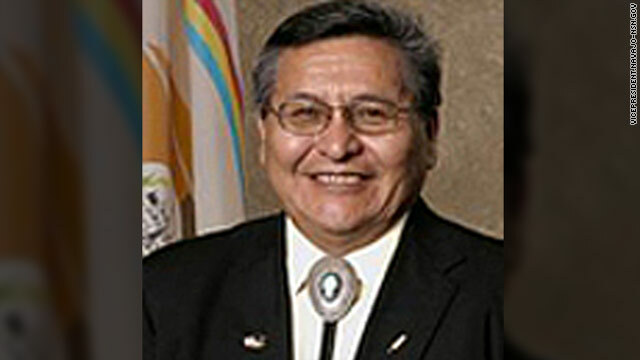 Shelly takes over for Joe Shirley Jr., who was Navajo president for eight years. Shelly was vice president the last four years. Filed under: Arizona • Crime • Native Americans • Politics • U.S.
A children's welfare center worker in Nagano poses with donations that say the gifts are from "Naoto Date," the ring name of a comic character. Children's homes and other social service facilities across Japan are reporting a rash of donations in the name of a 1960s comic superhero and other fictional characters. Most of the anonymous donations are being made in the name of "Naoto Date," a hero of pro wrestling comics in the "Tiger Mask" series, which dates to the 1960s, according to media reports. In the series, the hero, an orphan himself, make donations to children's homes, according to a Reuters report. 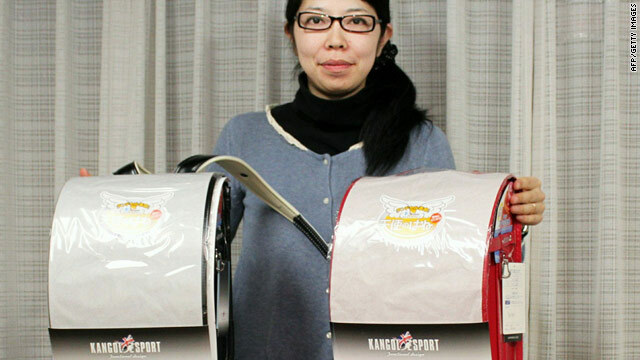 The donation flurry began on Christmas Day, when 10 leather school backpacks, valued at several hundred dollars each, were left at a Tokyo child care facility. Suspsect Jared Lee Loughner seen in his mugshot. The alleged shooter in Saturday's deadly Tucson massacre may have difficulty making the case for a successful insanity plea, experts said Tuesday. 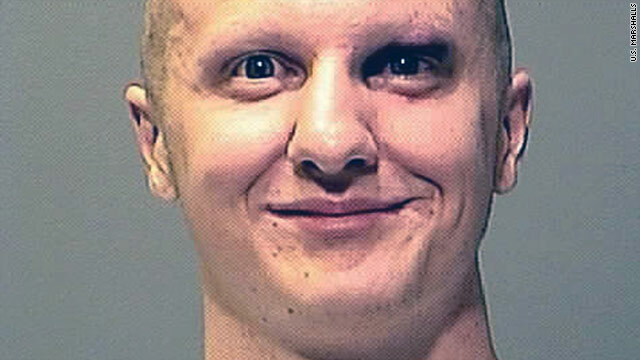 Jared Lee Loughner, 22, who authorities say shot up a gathering held by U.S. Rep. Gabrielle Giffords, D-Arizona, outside a supermarket, has been anecdotally regarded as very troubled and perhaps mentally unbalanced because of his ramblings spotted on the internet and the ways he has been described by acquaintances. But Paul Callan, a criminal defense attorney and a former prosecutor, and Jeff Gardere, a clinical and forensic psychologist, told CNN's American Morning Tuesday they have doubts that an insanity plea would stand. With the "amount of planning that went into this assassination," Callan believes "it's highly unlikely he will meet the legal insanity defense threshold." 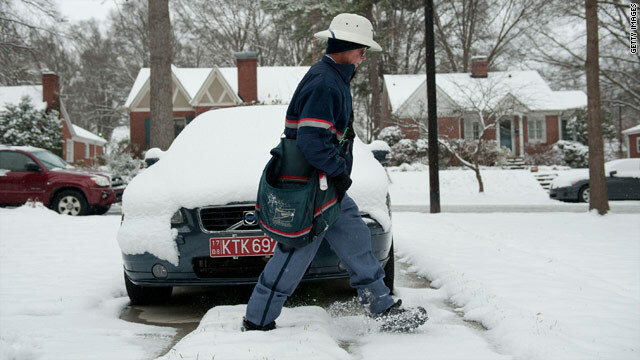 A postman braves a snowy path to try and deliver mail in Charlotte, North Carolina. A winter storm that paralyzed the South churned up the Atlantic coast Tuesday, destined to merge with another system from the Midwest and spell more misery for the Northeast. The National Weather Service predicted 5 to 8 inches of snow in the Philadelphia area, 4 inches or more in northern New Jersey and 2 to 6 inches in southern Delaware from Tuesday afternoon into Wednesday morning. It will be all snow as well for the 1-95 corridor Tuesday night and Wednesday, with 8 to 14 inches predicted for the New York City area and 9 to 15 inches for Boston. Emergency responders attempt rescues after the Deepwater Horizon exploded in April 2010. Several "specific and preventable human and engineering failures were the immediate causes" of the BP Deepwater Horizon disaster last year, the presidentially appointed Oil Spill Commission said in its much-awaited report Tuesday . The event "was almost the inevitable result of years of industry and government complacency and lack of attention to safety. This was indisputably the case with BP, Transocean, and Halliburton, as well as the government agency charged with regulating offshore drilling - the former Minerals Management Service," said commission co-chairman William K. Reilly. "As drilling pushes into ever deeper and riskier waters where more of America's oil lies, only systemic reforms of both government and industry will prevent a similar, future disaster." 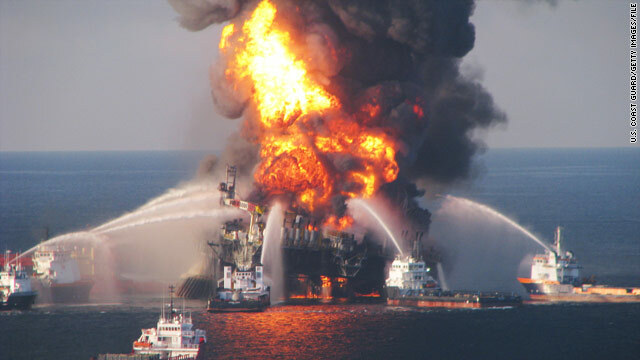 The report, "Deep Water: The Gulf Oil Disaster and the Future of Offshore Drilling," proposed "comprehensive" government and industry actions "to overhaul the U.S. approach to drilling safety and greatly reduce the chances of a similar, large scale disaster in the future." In a galaxy far, far away: The Hubble Space Telescope has captured this image of Hanny's Voorwerp. There's a green blob in space, but unlike a bad science fiction movie, it's not coming to take over Earth. Probably. 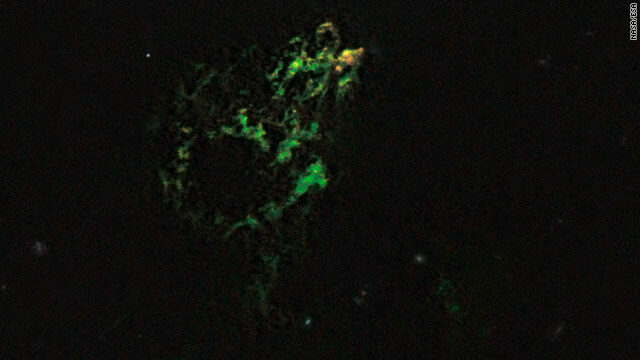 The Hubble Space Telescope has captured an image of a green cloud of gas about 650 million light-years from Earth. It's been named Hanny's Voorwerp, Dutch for Hanny's Object.